​My most recent bargain bin find is quite a gem. 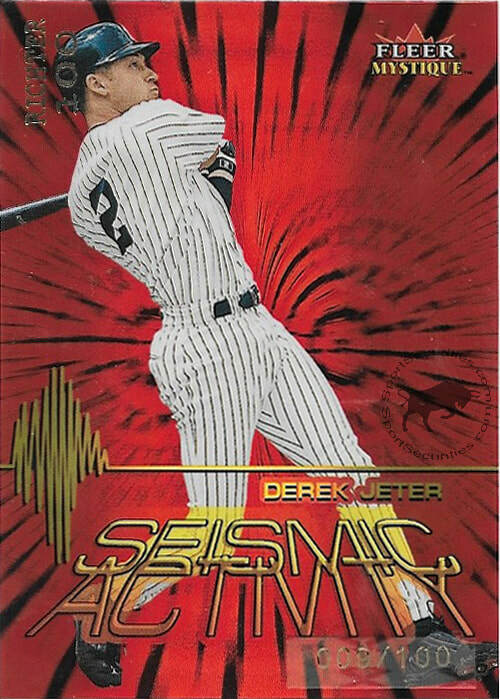 I was grinding through a box loaded with dollar cards and “half book” 90’s inserts, when I discovered a Derek Jeter 2000 Fleer Mystique Seismic Activity Richter 100 card #ed 002/100 (3SA). Holding the card in my hand, I couldn’t believe that it was available for purchase and that it was priced at half of book. Without hesitation I purchased it, and why not? 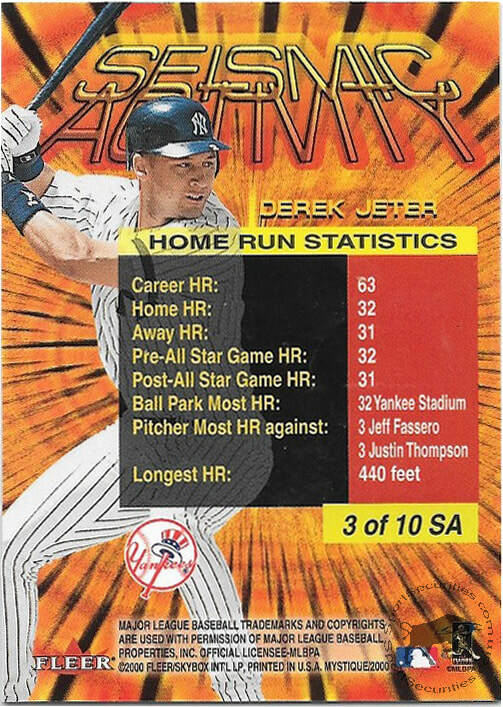 Even if you are not a Jeter collector, this card has a lot of things going for it. One, this card’s value greatly exceeds half book. Two, Fleer Mystique was a popular brand in its time and still carries an essence of desirability. Three, printed on lustrous red foil cardstock, this card pops with eye appeal and is just beautiful. And four, limited to 100 copies, the card is scarce. To my last point, scarcity is a relative term. I am fully aware that to some collectors, a print run of 100 copies might not be considered scarce. So, to justify the use of the word, I will impart a bit of distribution history on this card. 2000 Fleer Mystique boxes contained twenty packs with five cards per pack. There are no stated odds on the Seismic Activity Richter 100 cards, but the lesser parallel cards, which are orange and not serial numbered, were seeded at one per 40 packs. These cards alone are a tough hit. At six boxes per case, the odds of pack-pulling a base Seismic Activity card of any given player (ten total) is roughly one in every three cases plus two boxes. Based on this data, I am speculating that Richter 100 parallels didn’t fall at a rate of more than one per case. Now, this could be a gross underestimation. If Richter 100s do fall at one per case, with ten players in the set and 100 cards per player, that would only account for 1000 cases of 2000 Fleer Mystique. I could be wrong in my logic and if you know differently, please let me know. However, I think if you accept this thought process, it presents a good case that these cards are scarce.